Volpierre was a relatively recent alchemist who figured out how to make the stone through intuition. His process is so simple, it seems ridiculous. Chemically it makes no sense and nothing special should be able to come from it. Just by dissolving metal in an 'artful' manner, a red juice, the Red Lion, can be obtained from any metal (but antimony is the preffered metal because it contains the most power). And then once this Red Lion is redistilled 7 times, a white Philosophical Mercury appears which contains silver particles. In the distillation flask 2 salts are found, one yellow (sulfur) and one white (iron). The white one forms itself into a north-south dirrection because it's magnetic like iron should be. But these 3 salts will all dissapear and evaporate even in a sealed flask, so they must be kept in their own water. When these 3 salts are combined, a beautiful red stone is formed, but only after going through a series of color changes, just like what happened when the metal was first dissolved with acid. All of this I have seen before because one person had a website with photos of every step of this process, but that was several years ago, and he has since removed it. Most likely because it all too plainly reveals how to make a powerful stone which can be easily multiplied. *WARNING: When antimony trisulfide (stibnite) is dissolved in hydrochloric acid, deadly hydrogen sulfide gas is created. It's therefor essential to leave the flask outside while doing this procees in case the stopper blows off. Frater Albertus was a modern alchemist you should be familiar with (see the link in the 'Study' section of this website) and you should also by now have a copy of all his Golden Manuscripts series of books. And you would therefor be familiar with Volpierre's book. If not, you can download the book by clicking here. Frater Ablertus was teaching a class in Germany and met a man by the name of Heinz Fischer-Lichtenthal. He gave the frater a copy of Volpierre's book as well as a copy of his personal notes on exactly how to perform the work. He never intended either to be published, and never dreamed of the internet and how easily information would be shared across the globe in the future. But luckily we now have a copy of his notes, since Volpierre's book is so vague. Those notes are attached to the book you can download at the above link. Many foolish and ignorant modern alchemists have convinced themselves a special solvent needs to be made which dissolves gold, and it is the required key for making the Philosopher's Stone. And even though I do show the acetate path on this website, and it produces a special solvent for metals, it is not the one and only way of making the Stone. Even acids can be used, and they were wonderfully disguised by many names in alchemy books. And if you never tried making the Stone with acid, then you would never know that it works and that is indeed what many alchemist were refferring to when they used terms like "Philosophical Vinegar" or "Philosophical Wine". 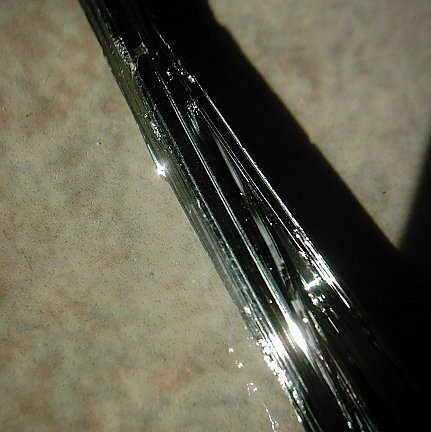 These two photos show a set of twin stibnite crystals that grew together. They are about 3 inches long and weigh approx. 13 grams. I like the idea of natural antimony crystals for this process, not just any stibnite ore. The crystals are extremely beautiful, but also may contain poisons like aresenic. Some people believe this impurities are what lead to success in this work, but I disagree. Even commerically bought anitmony sulfide powder can be used. Even though the crystals seem very hard like steel, they actually crush down to a powder quite easily. I simply placed them in the mortar and pounded them with the pestle until the crystals broke like shattered glass into small silvery splinters. I then rubbed the broken pieces against the mortar by stirring them hard, and a fine powder formed. Even though it says in the notes of Heinz Fischer-Lichtenthal that you must use sulfuric acid prepared by the lead chamber process because normal sulfuric acid is useless, I now know this is a lie. It was only put in the book to make the whole process seem impossible to perform using today's sulfuric acid. It is gate to block the information from ever being used by anyone who isn't smart of enough to realize it's a lie. It's sort of a test. All that is important for this work to succeed is that iron filings be placed in the flask with the antimony. 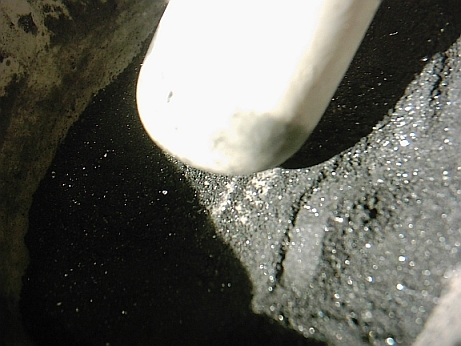 Not only does the iron remove the sulfur from the antimony but in doing so, it transfers energy to the antimony, much like the dry Star Regulus process does. And that iron will do it's job even better if it be strongly magnetized first. Also, there will Antimony Trichloride formed when the stibnite reacts with the hydrochloric acid. The side product is deadly hydrogen sulfide which is why Volpierre used an oversized bottle he could immediately close. And by doing it that way, he made the process extremely long, lasting months on end, because he only added acid is small amounts. It produces wonderful color changes, but is completely uneccessary for success. The process can indeed be sped up by simply dissolving all of the stibite and iron at once into the Red Lion, then moving on to the distillation steps. But if you still wish to see the color changes, then add only small amounts of acid each time, but leave the bottle or flask open outside. You can then photograph the color changes, then add the next bit of acid and it will change colors again. However, even in Volpierre's long digestion method, after the first juice of the Red Lion is poured off, he then instructs us to add more acid to the remaining metals in much larger quantities until everything dissolves into a red solution. So you can see the irony of waiting for months and adding only small amounts of acid each day, when in the end you are going to dissolve everything with as much acid as it takes. Many old alchemy books will try and convince you there is a dry way, and a wet way to the Stone. The wet way takes almost a year or more, and the dry way is the fast proess that takes only a few hours. And for the dry way the most commonly used chemical was orpiment (aresinc sulfide), because aresenic can dissolve gold. But there is no need to work with such deadly poisons in alchemy, and some dry paths are longer than wet paths. For example, the dry path with cinnbar, lime, and potash takes over year. And yet this wet path of using acids can take less than a month. With the recent ORMUS and ORME David Hudson montaomic elements craze, many people find themselves using acids to dissolve gold in the way I show in the section on the pH swing process for calxes. They sell this to people as monatomic gold, despite the fact it's merely white gold hydroxide, and with books like Laurence Gardner's, people are lead to believe this calx of gold is the Philosopher's Stone. And because of how ridiculous of an assumption that is, people who conisder themselves 'real' alchemists laugh at the idea of using acids in alchemy. They think their speical solvents and philosophical mercuries are so superior to the acids because the ORMUS fans have given acids such a bad name. But here in the Volpierre path we see how to properly use the acids to obtain a red juice from metals, which after special distillations, the Philosopher's Stone can be made, and indeed multiplied until it literraly glows like an ember of coal.